Incidentally, in Iceland this style of music is now known as touristcore. That term refers to how it panders to the elves and northern light image promoted by the tourist industry while simultaneously rehashing the twee-drama-romantic music style that broke into the mainstream with Sigur Rós, Múm, Björk a good 12 years ago. People who insist on flogging that horse are forced to make it outside of Iceland as back there they can't be heard over the sound of rolling eyes and despairing moans. A Trailer For Every Academy Award Winning Movie Ever; file alongside Charlie Brooker's self-referential TV news segment. I think that there are two reasons, first that TV producers think that viewers are stupid, secondly that the writers carry paintbrushes. I remember, as a child, watching Rolf Harris on a Saturday afternoon creating works of art using 4" paintbrushes. Big sheet of paper, slopping the paint everywhere and then, as if by magic, a painting would appear. Big tools, used well to create wonderfully subtle works of art. Writers today also use those 4" brushes, but they use them not for portraits, but to paint walls. Huge strokes slabbered on with no finesse. Before I visited NBC's character biographies I could guess the characters 'personalities'. You'd have the maverick, the womaniser, the hard as nails female, the unsure rookie, the heartless administrator, the drinker/gambler/philanderer. The list goes on. Oh, and we must not forget the racially diverse cast of good looking people. Look at those character types, you can see them appearing in pretty much every show. And yes, 'Casualty' does still make me grind my teeth - 'blonde sexbomb'. 'joker', 'socially awkward nerd in glasses' who, in the their second episode tell us what their personalities are by talking to a psychiatrist. Next series I think they'll stop giving the characters names and instead they will instead walk around carrying placards with their character traits written on them. The little ditty above is what I call "the musical cliché figure signifying the Far East." I would venture that a majority of music-culturally aware people would agree that there is such thing as "the stereotypical Chinese (or more generally Asian) riff." Most of them would also agree that the "canonical" form of it is the one notated above, typically instrumented with some kind of squeaky wind instruments playing in a pitch at least higher than middle C, and with some ticking-sounding rhythm instrument underlining the rhythm. Anyway, the author of the site, Martin Nilsson, has compiled evidence of the Oriental Riff and its earlier predecessors going as far back as 1847. A lot of the best disasters – asteroids, aliens, earthquakes, tsunamis – have already been taken, sometimes twice, as in the embarrassing simultaneous releases of Armageddon/Deep Impact and Volcano/Dante's Peak. So you'll have to be a bit creative. Pick something unusual: what if gravity started going sideways instead of straight down, say? In a cave underneath Mount Rushmore, the president should introduce the scientist to a crack team dedicated to fixing the problem – which should turn out to include his attractive ex-wife as well as a droll Englishman. The three of them should come up with a plan to stop the disaster – the more unrealistic the better. A good one in this case would be to have someone jump off the Empire State Building like a diving board in order to activate a nuclear weapon that would destroy the moon and thus reset earth's gravity; anything like that, really. Watching a cable news channel as they discuss who could carry out this dangerous mission, the team sees a report from the devastated New York, where the cat burglar is leaping across sideways skyscrapers to save an old grandmother's life. "By Jove," says the Englishman, "I think we've found our man!" The cat burglar dives. The scene cuts to outer space as the moon is destroyed. The sun tilts back on its axis, and back on earth gravity swings gradually back to its normal direction. Buildings right themselves and stand up straight again. Foreigners in turbans or Eskimo furs cheer and hug in far-off locations. The scientist reaches out for the hand of his ex-wife. And the little orphan boy runs up to his cat burglar dad for a dramatic hug, the Empire State Building back to normal behind them. He didn't die after all! And here's a Google search for "is the new rock'n'roll"; knitting, gambling, e-commerce, architecture and collective weblogging all come up. And here's the one for horror stories. Not surprisingly, serial killers feature several times in the list. 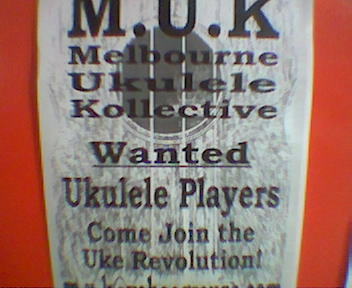 Colour me cynical, but I have some doubts about just how deeply the "Melbourne Ukelele Kollective" is informed by Marxist-Leninist ideology, as the name suggests. Granted, they could, by coincidence, be all committed socialists who gather to play the Internationale and other ideologically sound anthems of the radical proletariat on their ukeleles in North Korean-like unison, from each according to his playing ability; though, somehow, I doubt that. What's more likely is that they're just another group who decided to call themselves a "collective" because it's fashionable, in that apolitically consumeristic, Che-Guevara-T-shirt way. This trend of calling everything collectives has been happening on university campuses for the past decade, as students eke out ways to be revolutionaries and radicals until getting that job at the accountancy firm; now, it seems to have spread to the mainstream, and appears to be losing most of its Red trappings, with "collective" becoming just the trendy replacement for daggy old words like "club" or "society". What's next: The Chess Collective? The Red Rebel Motorcycle Collective? Celebrity fan collectives? The project team thought women would never want to look at the engine, so the front end is designed to come off in one piece at the workshop. Suggestions that did not make the cut included an on-board cappuccino maker and foot supports for high-heeled shoes. - "Call a Rabbit a Smeerp"
Use of a background out of Central Casting. Rather than invent a background and have to explain it, or risk re-inventing the wheel, let's just steal one. We'll set it in the Star Trek Universe, only we'll call it the Empire instead of the Federation. Read: The curse of coffee-table cinema, or how thanks to Disney's Miramax unit, much of "art-house" cinema is now formulaic, content-free soft-focus schmaltz designed to flatter viewers' sense of culture in a mindless sort of way. Miramax has given the world a host of cliches about European culture - naughty French priests, macho Greeks, hoity-toity Englishmen, zany Italians - and has reduced human complexity to a bunch of hopeless stereotypes bursting with sentiment.